HANOVER, Va. – At approximately 11:30 p.m. on June 5 the Hanover County Sheriff’s Office responded to a residence in the 11400 block of Pinhook Road, in western Hanover County, regarding a 911 hang up. Upon arrival Deputies located a 44-year-old female inside the residence deceased with apparent trauma. No one else was located at the residence. Investigators are currently working at the scene to collect all relevant information and notify the next of kin. Additionally just after arrival, a single vehicle accident occurred at the intersection of Pinhook Road and Vontay Road. When Deputies arrived on the scene of the crash the vehicle was unoccupied. Efforts are currently under way to locate the driver of that vehicle and determine if there is any connection to the death investigation. Anyone with further information about either of these incidents is asked to contact the Hanover County Sheriff’s Office at (804) 365-6140 or the Metro Richmond Crime Stoppers at (804) 780-1000. Citizens can also text Crime Stoppers at 274637 (CRIMES), using the keyword “iTip” followed by your tip. Both Crime Stoppers methods are anonymous. The victim has been identified as Leaudrey M. Salmon, 44, of the 11400 block of Pinhook Road in Hanover County. Details related to the cause of death will be determined by the medical examiner. Investigators have obtained first degree murder arrest warrant on Lamare S. Jennings, 38, of 12800 block of Broad Street in Goochland County in reference to this incident. Jennings is described as a black male, 5’11” and approximately 150 pounds. Jennings was known to the victim. A photo of Jennings is attached to this e-mail. Investigators are actively follow up on all leads regarding Jennings’ location. 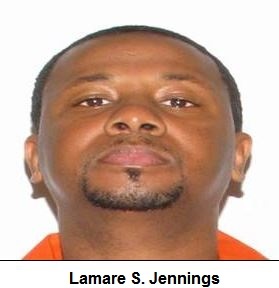 We are asking anyone with information on the whereabouts of Lamare S. Jennings to contact the Hanover County Sheriff’s Office at (804) 365-6140 or the Metro Richmond Crime Stoppers at (804) 780-1000. Citizens can also text Crime Stoppers at 274637 (CRIMES), using the keyword “iTip” followed by your tip. Both Crime Stoppers methods are anonymous. The death of Ms. Salmon has devastated her family and friends. We ask that you share your thoughts and prayers. Lamare S. Jennings was arrested without incident this morning at the Red Roof Inn in 4350 Commerce Road in Richmond. Investigators have transported him to Pamunkey Regional Jail in Hanover County where he is currently being processed on a first degree murder arrest warrant. Investigators have worked thought out the weekend to locate and apprehend Jennings and with the help of our law enforcement partners in the region, including the US Marshall Fugitive Taskforce and the Virginia State Police, he was located this morning. While much effort was used to locate Jennings, an equal amount of effort has been and will continue to be used to collect all relevant information and evidence to support the criminal prosecution. We continue to ask that anyone with information on this incident contact the Hanover County Sheriff’s Office. The media’s professional coverage of this incident was instrumental developing leads that were helpful in this arrest.